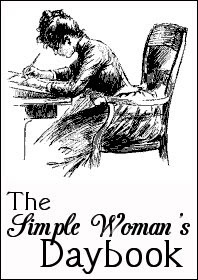 Head over to Peggy's blog, The Simple Woman's Daybook, to read more daybook posts, or join in with one of your own! Outside my window~the birds are having a field day out there this morning. All the rain we got yesterday brought those worms to the surface and the birds are enjoying a feast! Boy, if you're ever having a bad day, just be glad you're not a worm...they usually wind up being eaten by a bird or fish bait! I am thinking~ that this rain has made my weeds grow overnight! Hubby's going to have to mow the lawn before the weekend. I wish we had a cheap and easy way to kill these weeds and get good grass growing. When we had the drought in Georgia, you couldn't water the yard, and that meant you couldn't plant seed. So during those years, many yards got overtaken by weeds. I don't want to use harmful pesticides to kill them either, too many kids and dogs in the yard. Our yard is so big, that we can't afford to use the more expensive, but kid and earth friendly week killers. I guess I'll have to just look the other way! I'll enjoy my flowers and trees instead! I am thankful for~ God's Holy, precious, Word. It is there for me all the time, it is faithful, even when I am not. It lifts me up, encourages me, instructs me, and disciplines me. My life is not very joyful when I fail to be in God's Word every day. It's something I struggle with, but am really trying to overcome. I'm so thankful that God gave it to us, and that we live in a country where we can still read it at our own free will! I am wearing~ a black polyester shirt and a mid-calf black skirt with white, gray and blue flowers. Very comfy, and very pretty! I don't have any shoes on right now, but if the need arises, I'll put on my black flip flops. I am going~ hopefully no where! I have a lot I want to do today still, and this evening, the Biggest Loser will be on. The ONE AND ONLY show that I allow myself to watch every week. I don't like to miss it! I am currently reading~ Created to be His Helpmeet, by Debi Pearl. One of the most convicting but absolutely necessary, books I have ever read. I wish they would hand out this book to every Christian couple, or Christian wife when they get married. I certainly should have been following these biblical principles years ago! I am hoping~ that the Lord will work it out for us to go to Kansas and Colorado in August. We haven't seen hubby's parents since we left Kansas almost 3 years ago. His mom is in horrible shape, and we really want to get the grandkids there for her to see. It would be such a blessing for her. And in Colorado, where I grew up, my Grandma is having her 80th birthday party and they are trying desperately to get the whole family there to celebrate. I was the only one at Christmas that wasn't there for that, and I don't want to be the only one who's not there for her birthday party. It's so important to me, so I'm really praying. You never know when your last chance to see someone you love is. It may be the last time we are all together as an extended family. From the learning rooms~ only 4 weeks left! How exciting! We are nearing the home stretch and I'm already looking forward to next years curriculum. One day at a time, I must remind myself! Around the house~ busy! Laundry, mopping, organizing, cooking, schoolwork, cleaning! And we'll try to throw some playing in there somewhere! I want to try to do somemore of this as a family. 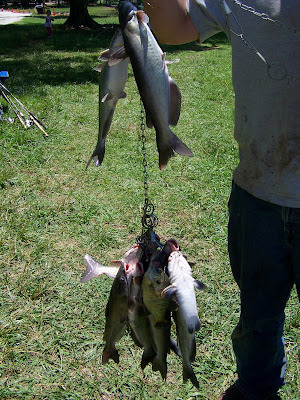 It's been almost a year since we fished as a family, and we've got the fever! Guess I should of been having a field day with the worms this morning! I'm also thankful that we live in a country where we can carry and read our Bibles freely. I think of people in countries where it's illegal and some people have only pieces of Scripture at a time that they must memorize so they can pass the Word onto others. We don't realize how blessed we are. I will be praying that the trips you want to make will be possible. Nothing is impossible for God! Have a blessed day. Hope you get everything done on your list! I've been hearing so many good things about the book "Created to be His Helpmeet." I'll have to check it out when I'm done reading "Feminine Appeal," which is convicting me to no end. So glad I stopped by today, your entries were so inspiring! I'm certainly hoping and praying that the Lord will see fit to work it out for you to be able to make both trips this summer. What memories that will be, not only for you, but your entire family. Many blessings to you! I am hoping you get to visit your family also. God's will be done.